Who is behind assassination of Russian Ambassador to Turkey? 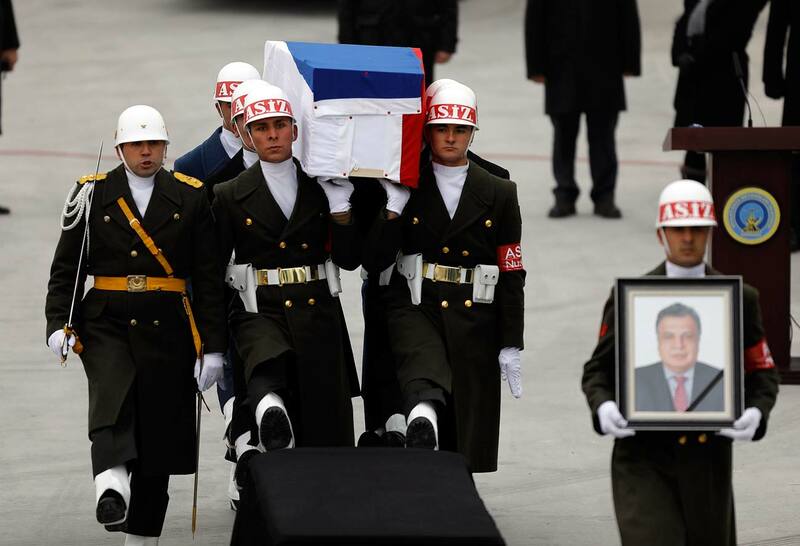 Flag-wrapped coffin of late Russian Ambassador to Turkey Andrei Karlov is carried to a plane during a ceremony at Esenboga airport in Ankara, Turkey. In the wake of the assassination of the Russian Ambassador to Turkey, political analyst Geogry Bovt discusses a few of the possible scenarios that provoked the murder in Ankara. Moscow and Ankara agree that the assassination of Russian Ambassador to Turkey Andrei Karlov was a terrorist act. If the objective was to upset the reconciliation process that has begun between the two nations, then it has only led to the opposite: solidarity before the face of a common enemy, terrorism, and continued efforts to resolve the Syrian conflict. The assassin has been killed, which will complicate the investigation. Who was behind the 22-year-old murderer, who had previously served in the Turkish police force? Here are several theories. In Turkey, the theory that militants connected to preacher Fethullah Gülen were behind the assassin couldgain strength. Gülen is in self-imposed exile in the U.S.
Turkish president Recep Tayyip Erdogan accused Gülenof inspiring the unsuccessful attempt to overthrow his government last summer. Erdogan considers Gülenthe main "enemy of the people," and it is common to link many government problems with him. After the coup's failure, Erdogan began large-scale purges and repression within the country, including within the security services. However, no purge can be 100 percent effective, everyone cannot be removed. Among the coup organizersthere were indeed people who spoke in favor of Ankara's harder line in Syria and consequently, against Russia and Assad. They obviously did not like Russia and Turkey's cooperation, and they could have struck against it. Most of all, they may have not liked how Turkey acted when practically full control of Aleppo was transferred to the Russian-backed Syrian forces. There are grounds to believe that Moscow and Ankara had concluded if not a formal than an "informal" understanding related to the "demarcation" of spheres of responsibility in Syria. Within the framework of such an informal "understanding," Turkey may have lowered the level of its support for the Syrian opposition fighting against Assad in eastern Aleppo. This could have helped Assad successfully take the city while militants, their families and civilianstried to leave the city through the humanitarian corridor. Ankara does not need a full defeat of the rebels, they will still be useful for Ankara to promote its interests in Syria "after Assad." Potential cooperation between Ankara and Moscow could have resulted in a larger constructive collaboration on the post-war order in Syria. However, other Islamists may not have taken a liking to this scenario, including those linked to rebel groups. Turkey itself has a complicated history "playing games"with Islamist extremists and is now facing the consequences of such games: terrorist acts have increased in the country. A faction of the extremists could have felt "betrayed" and decided to strike against Russia and Russian-Turkish reconciliation simultaneously. Other Islamist forces could have been behind the assassination, such as groups linked to the Al-Nusra Front or Ahrar al-Sham. Russian and Iranian intervention in Syria have seriously hinderedthese groups. And, in this sense, it is possibly not a coincidence that the terrorist act was organized on the eve of the trilateral meeting between the Russian, Turkish and Iranian foreign ministers in Moscow, in an attemptto undermine this meeting. Forces close to ISIS could have been behind the assassin. Turkish special services have had numerous encounters with ISIS. No purges "for links to ISIS" were conducted, therefore these links could just have been "hushed up." But some connections could have remained, as well as sympathies for the militants. There is a simpler version. It is possible that the assassination is the work of a lone terrorist or a small group of Islamist terrorists. Terrorists groups consisting of 1-3 people (basically, suicide bombers indoctrinated with Islamist extremist ideology) have become active in many countries recently. The assassination of the Russian ambassador could be such a case. The 22-year-old assassin could have been emotionally driven by media reports of Russia's and Assad's actions in eastern Aleppo. Turkish media also reported on the slaughter, which increased even more as the Iraqi Army and the Shiite and Kurdish units launched a large-scale military operation to liberate Mosul from ISIS. Media sources that shout about the "barbarian bombing" of eastern Aleppo and mass losses among the population are categorically silent about the same situation in Mosul, where the population is larger, the scale of the operation is broader, the inter-ethnic conflictis more acute, and ISIS's actions are more barbaric. Under the influence of such media coverage, the assassin decided to "avenge Aleppo." The "Kurdish theory" is also possible. The Kurds are taking revenge on Ankara for everything that it is happening in northern Syria, having organized an "exclusion zone" on territories the Kurds liberated from ISIS. However, this theory is the weakest. It is difficult to imagine that a person linked to the Kurds could have been a Turkish police officer. The ethnic principle there has incredible significance. Finally, there is one more crazy theory. Some Russian politicians affirm that the ambassador's assassination was possibly the result of "a secret NATO operation." For spy novels, this is perfect, and just as ridiculous asthe theory of "Obama's revenge on Putin. "However, this theory, if it is considered seriously for a moment, leads to a simple question: why does NATO need a casus belli with Russia? Since, indeed, this assassination is a casus belli. The fact that some politicians entertain such theories just shows how poor relations are between Russia and the West in general, and between Russia and the U.S. in particular. In such a situation, it is better not to fall for propagandistic hysteria. It is clear what it can lead to. Karlov was assassinated in the hysteria surrounding Aleppo. And this is crucial, regardless of the theories about this assassination.